We just made it back from another backpacking trip. We’re already dirty and tired, but Chris, Doug, and I welcome the drive ahead, a scenic road in the middle of nowhere to Bryce Canyon National Park. 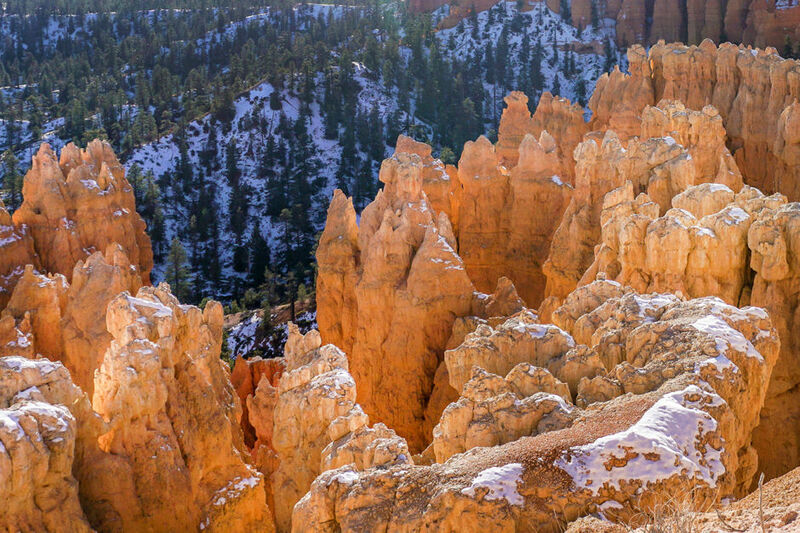 I have never been there and this will be one of my longer trips through Utah. 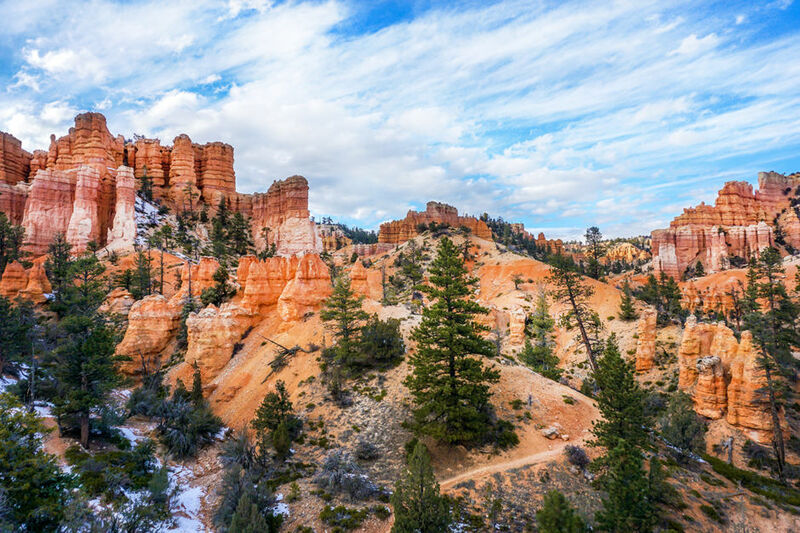 From what I’d heard about Bryce Canyon, I know this trip will be one to remember. 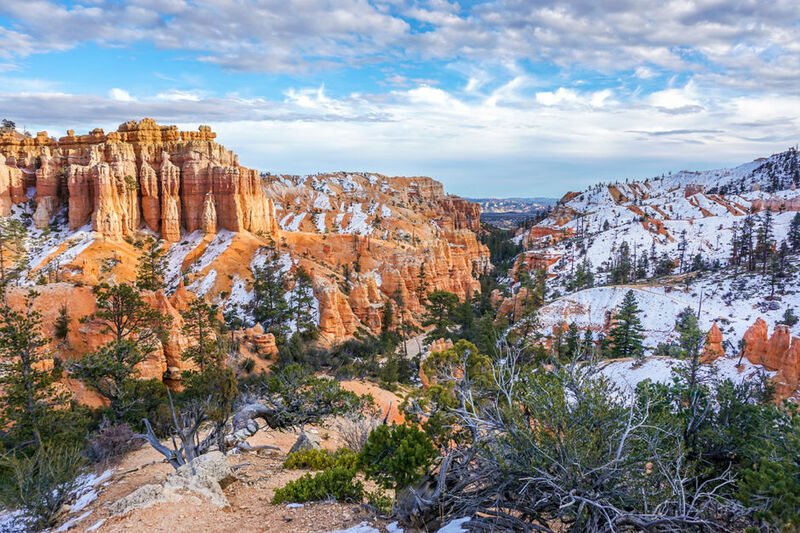 Before we even enter the park, the iconic formations of Bryce Canyon National Park begin to puncture the horizon. 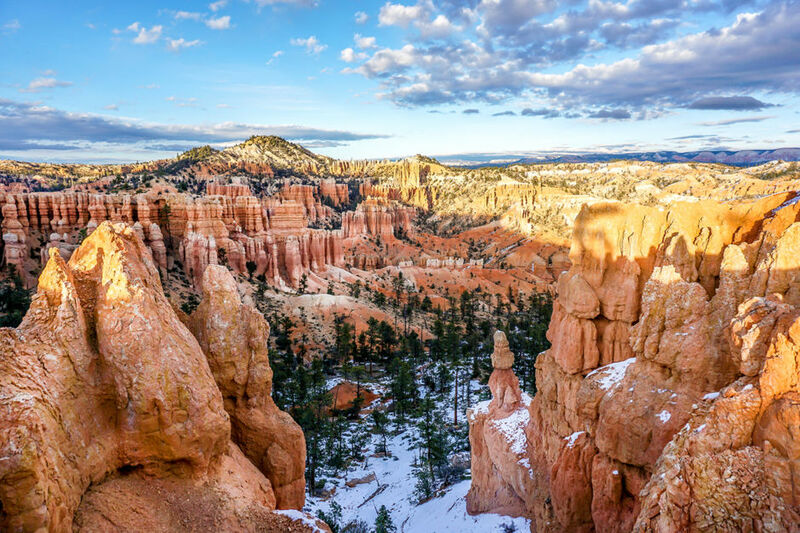 The almost 56-square mile park is speckled with hoodoos, the rock formations Bryce is renowned for, which are typically composed of hard rock topping a softer, easily eroded stone. We look over the edge of the canyon to get a better look at the hoodoos. The morning light hits them before it touches the trees below, and the snow details their infinite contours. 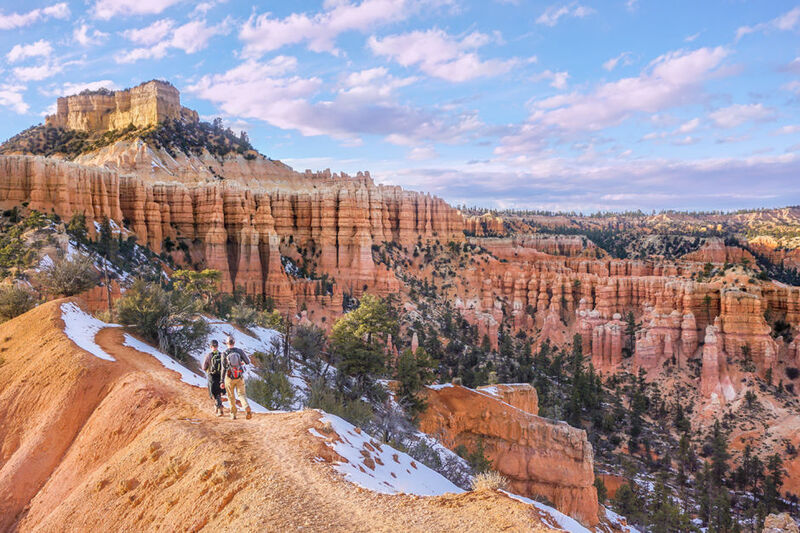 We begin the Fairyland Loop Trail, a moderate to strenuous 7.9-mile loop that also includes portions of the popular Rim Trail. 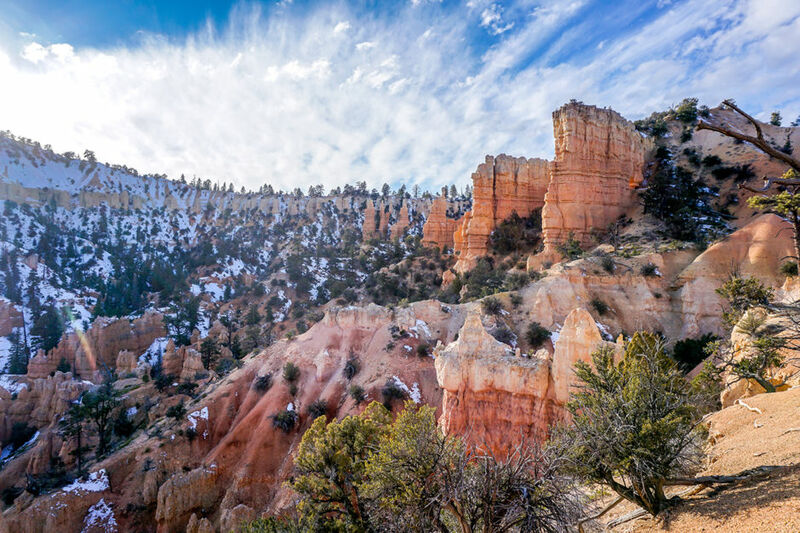 Its difficulty rating is attributed to the elevation gain as you meander along the rim and into the canyon, giving you changing views with every turn. 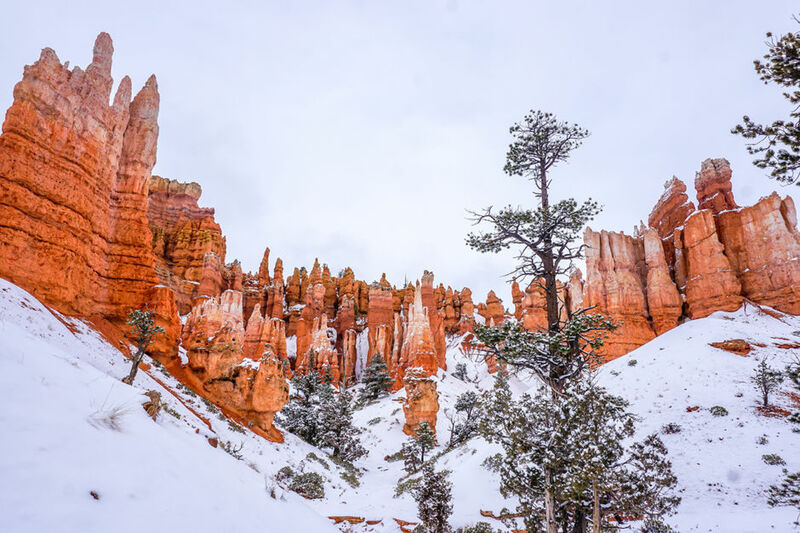 A recent snowfall produces a hill blanketed in white, forging a stark contrast for the fiery hoodoos. Wondering where our trail will lead us next, we admire the view as we discuss the unique geologic formations and glance at our map, pointing out the names of nearby valleys and cliffs. True to its description, the Fairyland Loop tries us with sporadic elevation gains and losses. But true to its name, we feel as though we’ve been transported into another world. 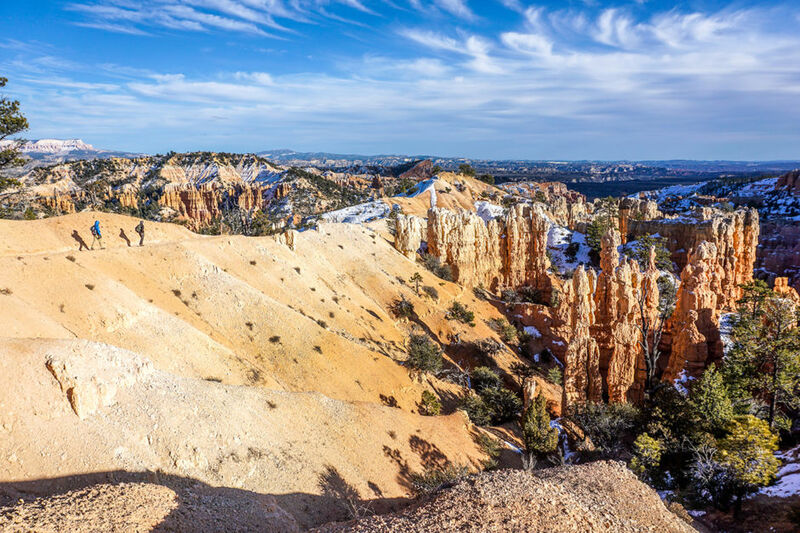 The hoodoos stand as a stark contrast against the blue skies, and with each turn, we pause in awe at a new sight and new reason to marvel at Bryce Canyon National Park. I’ve never seen anything quite like it. The sky opens to what appears to be an endless sea of quirky rock formations. The sun begins to lower and the sky acquires a gentle purple tint. 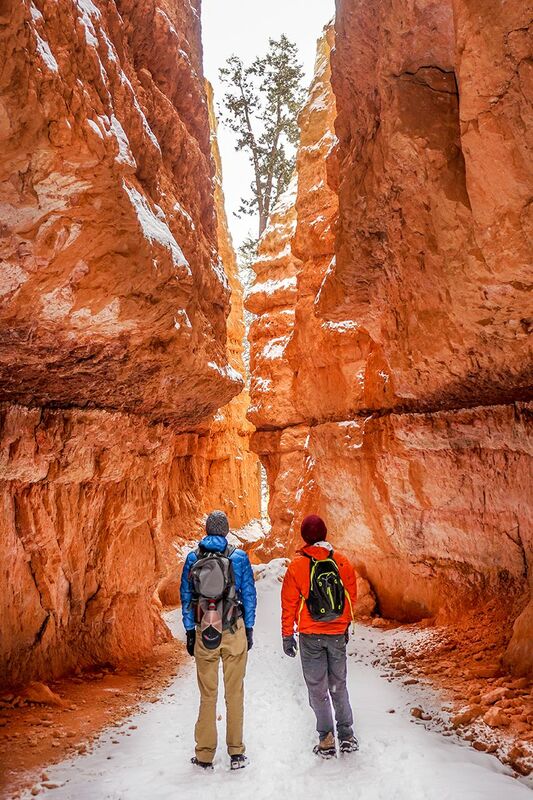 We finish our loop and an incredible day in Bryce Canyon National Park. Doug and Chris make their way along the trail, ready to head out of the park for dinner and a much-earned sleep. We brush the snow off the rooftop tent as we carefully clamber down. It snowed last night, and it’s snowing now. We cook sausage and eggs on our tiny stove before packing up and heading back into the Bryce Canyon National Park. We park, and walk to a nearby overlook. 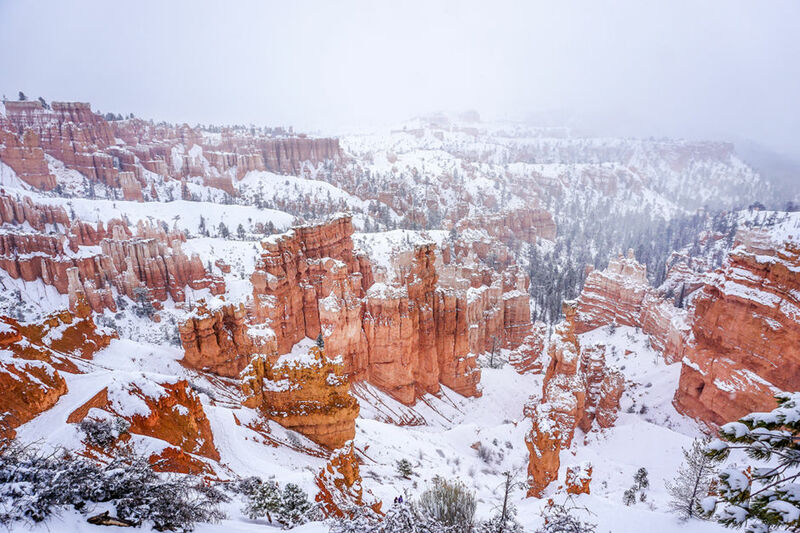 Our views are now socked in by thick snow clouds, and Bryce is a winter wonderland today. We decide we want to dive into the depths of the canyon, and plan on the Queens Garden and Navajo Trail combo. The complete hike is just a little over three miles, so it’s the perfect distance for a day that is trying to chill us to the bone. We layer up, snack up, and are careful to choose our steps wisely, as the trail offers a steep drop off to the side. As we reach the bottom, Chris and Doug stop a moment to look at the incredible formations towering above us. A light dusting of snow causes the rock to glow like embers and the juxtaposing colors cause a distinct contrast. Shied away by the weather, there are few others out today. We shuffle along a slippery trail, alternating between snow and ice, thankful we came prepared with proper traction. 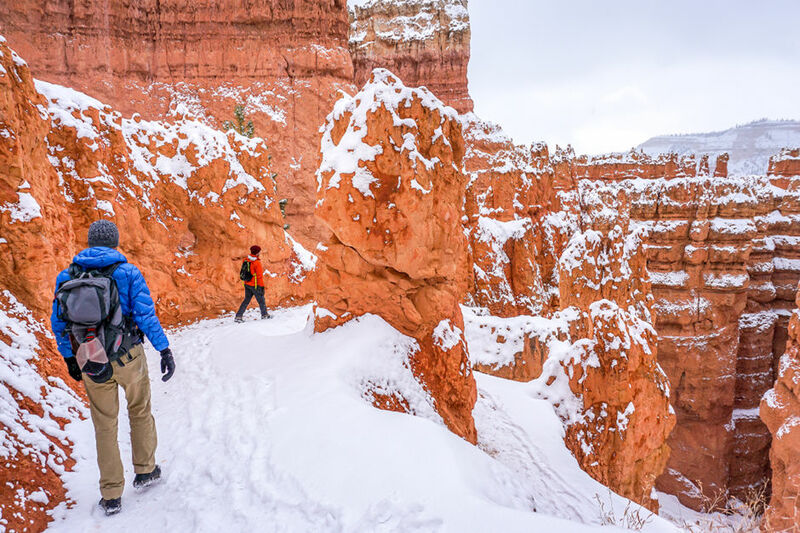 Whether it’s snowshoes and microspikes, plenty of layers, hiking poles, or water, it’s important to remember to always be prepared for all kinds of weather.